Robotic Palletizing Components feature pre-engineered configurations. Available for high-speed bag palletizing or compact end-of-line case palletizing, PalletPack 460 function package consists of IRB 460 palletizing robot, Flex-Gripper EOAT, control PLC, Jokab safety PLC, PalletWare support software, user documentation, and FlexPendant graphical HMI. The 4-axis IRB 460 features 2.4 m reach and 110 kg capacity, and streamlined programming wizard does not require PLC programmers to have specific robotic experience. AUBURN HILLS, Mich. - ABB Robotics has launched the PalletPack 460, a pre-engineered package of proven robotic palletizing components featuring the new IRB 460 robot designed specifically for high-speed end-of-line palletizing. The packaged configuration offers integrated hardware with full documentation, significantly reducing overall project costs and engineering set-up time. It will allow integrators to more easily specify and design palletizing systems, and reduce the barriers for end-users to realize the benefits of robotic palletizing automation. Available for either high-speed bag palletizing or compact end-of-line case palletizing, the function package consists of an IRB 460 palletizing robot; a Flex-Gripper end-of-arm tool; an ABB control PLC; a Jokab safety PLC; PalletWare support software; user documentation; and the ABB FlexPendant featuring an easy-to-use graphical HMI. "ABB is committed to providing state-of-the-art, cost effective palletizing solutions to the broader packaging market," said John Bubnikovich, executive director, marketing and business development, ABB Robotics. "The PalletPack 460 function package provides material handling integrators the opportunity to offer a high performance palletizing system in a pre-engineered configuration that is flexible, easy to install and easy to operate." The heart of the PalletPack is the IRB 460, the fastest known palletizing robot on the market. The 4-axis IRB 460 features a reach of 2.4 meters and 110-kilogram capacity, with a compact footprint that makes it ideal for integration into existing packing lines. A prime feature of the PalletPack is the programming wizard which makes the programming very similar to that used for a traditional PLC. This enables PLC programmers without specific robotic experience to program the system, eliminating the complications that can arise when special skills are required. "PLC programming is a preferred programming language at a majority of manufacturing and logistics facilities," said Bubnikovich. "The PalletPack 460 eliminates the need for special robot programming know-how and provides complete cell control in one function package." 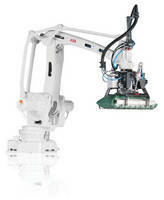 The programming and operation are carried out via the user friendly FlexPendant, the standard ABB Robotics HMI. This features a graphical interface with four user-friendly screens: pallet and pick set-up, pallet pattern set-up, path profile edition and movement edition.